During the Presidential campaign, Donald Trump called for a complete ban on Muslims entering the U.S., surveillance of mosques, and a database for all Muslims living in the country. 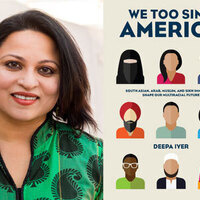 In We Too Sing America, nationally renowned activist Deepa Iyer shows that this is the latest in a series of recent racial flash points, from the 2012 massacre at the Sikh gurdwara in Oak Creek, Wisconsin, to the violent opposition to the Islamic Center in Murfreesboro, Tennessee, and to the Park 51 Community Center in Lower Manhattan. Iyer asks whether hate crimes should be considered domestic terrorism and explores the role of the state in perpetuating racism through detentions, national registration programs, police profiling, and constant surveillance. The program will be introduced by Tariq Touré, an award winning Muslim Writer and Social Justice Advocate born and raised in West Baltimore, Maryland. Touré is an awardee of the MPower100 Muslims fighting for Social Justice, HBCU Top 30 under 30 Alumni and Baltimore Magazine's Rising Community Voices. Touré holds a Master's of Social Work in Community Administration and Policy from Howard University.